Sunday evening (Nov. 26), the 2017 Soul Train Awards are set to air on BET, beginning at 8pm ET. This year marks the third consecutive year Erykah Badu has been tapped to host the annual award show, with the veteran singer revealing during a recent interview how the occasion is much more than just a fun gig to her. "Being a part of the show is magical," Badu says, speaking with Vulture. "Growing up, we never missed Soul Train. That was one of the only times we got to see the artists we loved outside of their album covers. It was like, 'Okay, here's the Isley Brothers; _here's_Funkadelic.' Soul Train was all we had. To now help make the kinds of memories that I had for the people watching today is inspiring." In addition to talking about how the awards show inspire her because they create an opportunity to embrace one's musical heritage and connect with the younger generation, Badu also explains how hands-on she really is with the awards show. "The preparation is so exciting for me: I'm hosting the show. I'm writing the show. I'm producing on the show. I'm choosing my own writing team. 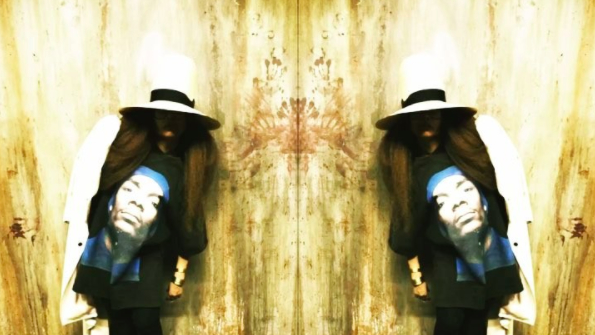 It's unreal," Badu explains. "I come from a theater background, so I've trained in all the things that go into putting on a show like the Soul Train Awards, but I don't get the opportunity to then go ahead and use them. Now I'm finally getting a chance do that, and in a big way. It's a dream." Keyshia Cole, Method Man, DVSN, Daniel Caesar and more have all been tapped to perform during tonight's celebration, with the awards show also honoring Toni Braxton as this year's recipient of the Legend Award. Be sure to tune into BET to catch the airing of the 2017 Soul Train Awards, beginning at 8pm ET.